We’re excited to be sharing the announcement of the official release of #CountHerIn, a report on the status of women and girls in Oregon. 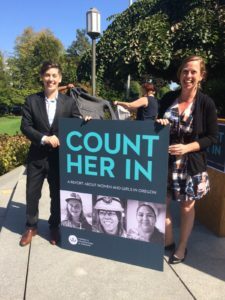 #CountHerIn is the most comprehensive report on Oregon’s women & girls in 20 years released by the Women’s Foundation of Oregon. In a widely held belief that Oregon is a progressive beacon within the U.S., the report provides some startling data about the experiences of women and girls in relation to domestic violence and sexual assault rates, lack of access to affordable childcare, barriers to reproductive health services, and others. But there is still plenty to celebrate about the status of Oregon’s women and girls including the fact that Oregon women serve in statewide elected office at some of the highest rates in the country and that Oregon girls met the state’s 2025 goal for college graduation rates in 2014, eleven years ahead of schedule. The report was a huge collective project, in which Family Forward was honored to be a part of. We look forward to using the report to support our campaign for our upcoming campaigns on a statewide paid family and medical leave program! To read the report visit the Women’s Foundation of Oregon’s website. Women’s Foundation Executive Director, Emily Evans with CareWorks Director, Lili Hoag.